Happy Friday! How was your Memorial Day weekend? In a complete spur of the moment decision, we decided to hit NYC for a couple days for Fleet Week. Because of all the travel we’ve done lately, we were originally planning to do nothing for the long weekend, but I’m glad we made the trip out to New York. I realized that we’ve been to every single NYC Fleet Week in the past 6 years (except the one they canceled in 2013 because of federal budget cuts), and I’d really like to continue going every year. 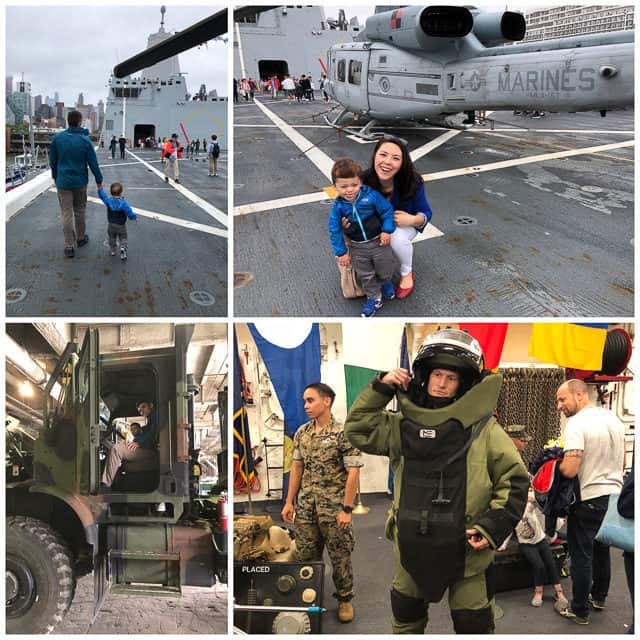 If you haven’t heard of Fleet Week, it’s an incredible week long event and tradition every year over Memorial Day where active duty ships with US Navy, Marines, and Coast Guard dock into the west side of NYC, and give the public tours of the ships and put on special shows throughout the city. What I love most about Fleet Week is how hands-on the visits are. You hold the weapons they actually use, sit on their helicopters, climb up into tanks, and ask the servicemen any questions you can think of. They are always so generous with their explanations and eager to talk with everyone about what they do. That’s an 87-pound bomb squad suit that is worn when disarming and disposing of bombs. 87 POUNDS!! Can you imagine putting that on, and having to go disarm a bomb? I won’t even try to explain how cool it is to sit in the helicopters, tanks, humvees, or simply to walk around the ships they bring in. It’s quite an experience and amazes me every time. Even though Pete is finished with his service aboard US Navy Submarines, I’ll never lose my appreciation for everything these men, women, and their families sacrifice to serve our country. I’ve never had a potato pancake like this before. I’ll be trying it. Though I have some in my pantry, I never really knew what to do with celery salt. I was nodding my head through so much of this. Oyster sauce, explained. I admit to using it and not really questioning what it was, hah! Hands up for the idiot zone. Watching this celeb makeup tutorial was fun. #3 (the Mike’s Pastry Cannoli) is one of the best things I’ve ever eaten in my life. And I previously thought I didn’t like Cannolis. I need to try the others. Yes! Cashew milk tastes so much better than almond. I drink it daily. The perfect size for roast chicken. I always try to pick out the smaller ones. I started doing this stretch daily after my posture changed carrying a baby around all the time, and it helps SO much with opening up the chest and shoulder slouching. Some Internet hairstyles I might actually be able to pull off. How long to steep your tea. Pete is such a stickler about temperature and time, and I have to say it makes SUCH a difference!